This is terrific Carin. In fact the first line of several songs spring to mind as I look at it. Great shot. And, please, Barbara, if you’re moved to sing those first lines… I’m all ears. Serene and perhaps a little curious? Great silhouette against that wonderful blue, blue sky, Carin. There’s the story, Cheryl. What does one think when one is a bird perched upon a wire? It must be a curious and entertaining view of the world of people! THAT would be great science. To hear the animals’ version of *us*. Love….. We have a bridge in town where the birds gather on a wire. Every time I see them there….as I sit at a red light I swear I’m going to get a picture. One day……. Carin, the simplicity of this took my breath away. 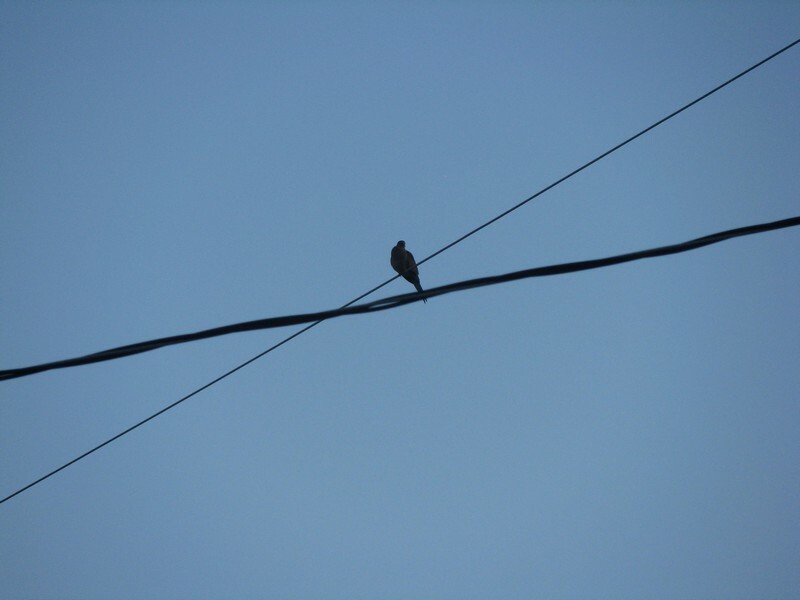 The intersecting power lines and the single bird on the wire is a beautifully presented “negative space” photo. Well done. he looks like a high wire birdie! Unlike the woman leaning in her darkened door, I say no more is needed. A picture of minimal perfection. I try, in my way, to be free. Better late than never … I’m here! I too thought immediately of Cohen. (That’s a song my friend Julie and I have sung together many times … with harmony!) It’s an arresting photo — so simple but striking in composition, the lines pulling the eye toward that small but discernible silhouette of the bird. Love the contrast of black against the blue sky.